CarGurus has 2,048 nationwide A8 listings starting at $1,500. Traditionally long on agility, not to mention power, posh and, of course, price, Audi’s legendary A8 full-size luxury sedan is slated to get a couple of further tweaks for 2015. Stuff like slightly redesigned front and rear fascias, some upgraded cabin accent materials and a bunch of added techno-goodies are expected to give this legendary cruiser some extra panache in the ultra-competitive Euro-luxury market. Once more, trims are expected to remain the base 3.0T, the L 3.0T, the up-powered 4.0T and its L 4.0T counterpart, the potent L W12 and the turbodiesel L TDI. All trims with the L designation sport a 122.9-inch wheelbase, as opposed to the more compact 117.8-inch configuration toted by the non-L versions. Oh, and of course all 2015 Audi A8 iterations return delivered with standard full-time all-wheel drive (AWD), thus retaining the “quattro” designation. Audi assures us that one of the new perks for all 2015 trims, meantime, is a redesigned trunk alleged to be larger than the 13.2-cubic-foot lunchbox-size boot 2014 versions carry. Further upgrades should also include newly redesigned head- and taillights and a bunch of new safety systems, including some debuting updates to the optional night-vision technology. In any case, depending on the trim selected, look for 19- or 20-inch alloy wheels, a power sunroof and heated power-adjustable mirrors to remain standard outside, with heated power-adjustable front seats, premium leather upholstery, cruise control, telescoping tilt-wheel steering, full power accessories and an auto-dimming rear-view mirror inside. Dual-zone climate control, a rear-view camera, rear parking sensors and memory for driver's settings, meantime, are expected to remain bolstered by standard voice-activated, hard-drive-based navigation and Bluetooth hands-free communications, as well as Audi’s MMI electronics interface with Wi-Fi access. The L 3.0T again adds the standard Warm Weather Package, including 4-zone climate control and rear power sunshades, as well as the Extended Leather Package with upgraded leather accents and piano-black inlays. Finally, the 4.0T and its L counterpart each offer additional noise-cancellation technology. Standard entertainment for all trims except the L W12, meantime, includes a 640-watt premium Bose stereo with 14 speakers, satellite radio and a memory-card slot. Options choices again depend on the selected trim and remain mostly in package form, including massaging front and rear seats, rear-seat DVD entertainment, a heated steering wheel, heated rear seats, a sport-tuned suspension with limited-slip rear differential, a fixed panoramic sunroof and a head-up display. Power for the base 2015 A8 3.0T and the L 3.0T again comes from a 3.0-liter supercharged V6 that mates with the traditional 8-speed shiftable automatic transmission for 333 hp and 325 lb-ft of torque. With variable valve timing (VVT), this super-blown six-banger should once more get 18 mpg city/28 highway. The 4.0T and its L 4.0T sibling, meanwhile, get an up-powered version of a 4.0-liter twin-turbo V8 that now puts out 435 hp and 444 lb-ft of torque. Mileage numbers are as yet unavailable for the tweaked turbocharged V8, but new cylinder deactivation technology will shut 4 of the 8 cylinders down at highway speeds to add some miles to every tank. Potency personified, the A8 L W12 returns toting a 6.3-liter W12 powerplant that is again under the auspices of the 8-speed shiftable automatic. Look for 500 hp and 463 lb-ft of torque out of this monster, with cylinder deactivation helping achieve 13/21. Alas, bear in mind that all non-diesel A8 powerplants require premium gas. Speaking of diesels, the L TDI, introduced to the 2014 A8 stable, totes a 240-hp 3.0-liter turbocharged diesel V6 that, once more under the charge of the 8-speed shiftable automatic, allows a massive 406 lb-ft of torque. Expect a truly impressive 24/36 from this powerful but precious turbodiesel. Along with the usual array of airbags, antilock braking (ABS), traction and stability control, rear-collision alert and blind-spot warning, the 2015 A8 has some added optional safety technology that’s new for this year, including a Driver Assist Package that includes active lane assist to prevent lane poaching and an overhead-view camera for help with parallel-parking challenges. Meanwhile, turn-signal-integrated mirrors remain standard aboard all trims, as does secondary collision braking assist, while available adaptive cruise control features pre-collision braking. 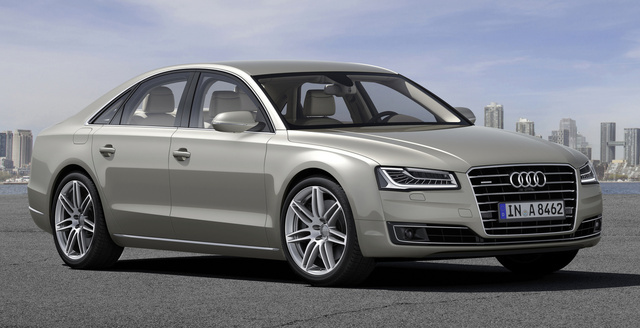 What's your take on the 2015 Audi A8? Have you driven a 2015 Audi A8?